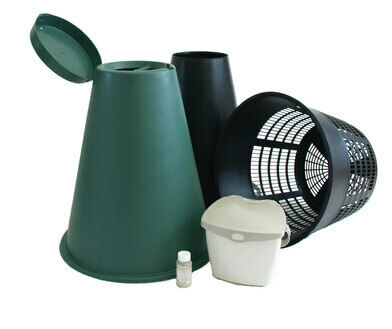 The Green Cone compost digester can be used to compost all household food waste, including meat, fish and other food waste; plus it is completely odour-free! Simply open the cover, put your food waste in the cone and close the cover. After several years in a Green Cone, household waste is gradually transformed into water, carbon dioxide and negligible quantities of waste. Food waste can be disposed of immediately. All remaining household waste is ready for recycling. The device is easy to install and maintain. It also works in cold weather. Organic matter decomposing in the ground nourishes nearby plant roots. The device reduces pickups of household waste by up to 50%.